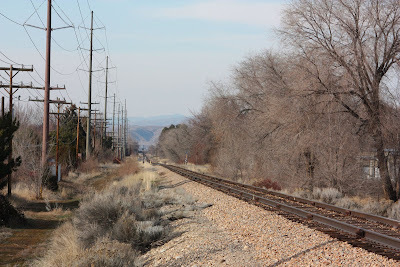 These tracks run near Federal Way in East Boise. We don't have passenger trains in Boise, or any that stop in Boise (Amtrak). These tracks feature freight trains - and not that often. For some reason, I love train tracks and I could walk along these for hours...very nice shot! Maybe the situation will change in the next four years and Boise will get a passenger train. It's such a civilized way to travel. I love train track photos. I'm not sure why, but they have become such a popular photo place! Trains are a dying race, really. And it saddens me. I love trains, and I love the idea of sitting on a comfortable seat and watching the countryside fly by...without the stress of watching the road! I hope we always have trains...trains we can ride, that is.